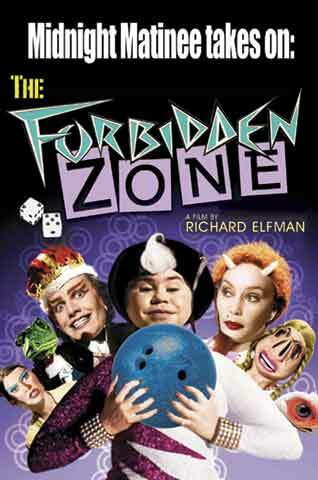 October 27, 2012: Midnight Matinee takes on possibly the greatest movie of all time, Richard Elfman's The Forbidden Zone. Living in the sixth dimension just got a tad more rough. Long time since I saw this. Going to pull it up very soon. Join John on the comments list this evening. And remember to click on that bar that says pledge on top of the playlist. This is the best Cab Calloway cover ever, in the history of mankind. I was completely confused upon first watching The Forbidden Zone. Probably will be next time as well. You'll be more confused after this show. This is Keyana Stevens, who also did the instrumental "Cell 63" earlier. We also heard Diane Kredensor singing Some Of These Days, Chris Andrews performing Bim Bam Boom and Jack Spillum with the Forbidden Zone theme. Because tonight is all about the cover tunes, peeples. Show of hands here: who wants an army of zombies? Definitely the best movie of all time! Would that be a private army of zombies or something on the state or federal level? The rules vary from state to state; I believe in New Jersey you have to get a license for an army of zombies. Hey everyone, you see that little dog and cow in the corner? They want you. Thank you John. For the next two hours join me as we attempt to reach the ur-moment, the moment when I play Erma Bombeck and Uri Geller back to back. Will it happen tonight? I've been doing this for 17 years and have yet to reach that moment. But I keep trying. thanks for letting me play here, Rich. great tunes... still digesting the last matinee "paris, taxes"